I noticed that when I play as Delta during the gun tutorial, the practice targets are half normal, half scrambled graphics, with random pixels. I don't know what's the cause of this. I tried updating my drivers, didn't do anything. I tried changing resolution, also didn't do anything. You are playing on Windows ? Did you try in windowed mode ? I am playing on Windows 7. I'll try playing in windowed mode, but the odd thing is, I never had to do that before in this game. Okay, so I checked the windowed mode and it didn't fix the glitch. Well i dont exactly what happened, but, it's the first time you play this game on that computer ? The core issue with Gemini Rue is that it is a native 16 bit game, which most modern monitors can't handle properly. The good news is that I'm recompiling all our old games with the latest version of the AGS engine, which SHOULD take take of a lot of these issues. This... might take a while. Well, I played it before and it seemed fine. The glitch appeared after I returned to the game after some time. Oh, so you're a developer? Well, then congratulations, because I absolutely love Gemini Rue. it's a shame this glitch appeared. Will this recompiled version become an update for the current game? I really, really hope it won't be released as an HD "remaster". Hi. I'm Dave. I run Wadjet Eye. Nope. Not an HD remaster. I'm just recompiling the game in the latest version of the Adventure Game Studio engine, which Gemini Rue was created in. The latest version fixes a LOT of graphical and resolution issues with modern monitors. When Gemini Rue was created, a native 16 bit game in 320 x 200 resolution was not a big deal, but it's a REALLY big deal now and most modern monitors don't know how to handle it. The newest AGS engine handles these things better, so I figured it was time to finally recompile the game. However, that also means that old function calls no longer work and have to be re-written. So I need to work on doing that. I'm going through all our old games in order. I'm going through the Blackwell games at the moment, and when I'm done with those I'm going to do Gemini Rue. So, I assume it will become an update, then? Available on Steam and such? Thank you for answering. While it doesn't directly solve my problem, it's good to know I can at least wait for a solution. Well, I hope it will be a solution. Hey. If you like, you can be an early guinea pig. 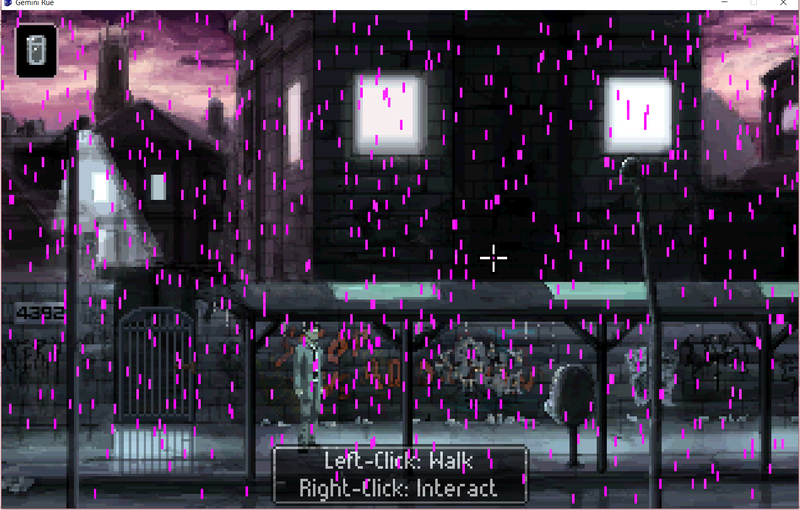 I've managed to get the rain working and the game compiles just fine. I haven't TESTED it at all beyond that though. I have about 3 games to get through before that. If you'd like to try it out now, email me (dave@wadjeteyegames.com) and I'll send you the build! Sure, I've sent you an email already.